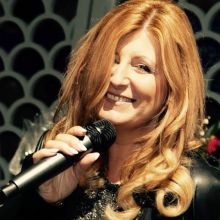 "The Voice of the Century" is how Charlie McGettigan described Kathy Crinion's talent recently. The Irish singer has, in 18 months, come from relative obscurity to being the recipient of two significant Irish Country industry awards and a nomination as Best Female at the recent Irish Country Music Awards. Kathy put her career on hold to raise her family having kept her toe in the musical waters as a studio backing singer until she was ready to rejoin the fray. Now her much anticipated album "Lovin' What I Do"(ISGR/Venus) heralds her arrival with trumpets blown by Nashville's top writers who have supplied original material for this velvet smooth voice to weave it's magic upon. Pat Alger(5 number 1s for Garth Brooks), Wood Newton( Grammy winner), Jan Buckingham(Grammy nominee for Whitney Houston) join a plethora of other renowned song smiths at the peak of their game as they contribute to this world-class collection which spans the genre from cutting edge Country rockers to silky smooth love ballads and all amplified through that iconic voice and supported by a stellular gathering of the most gifted musicians on both sides of the Atlantic and produced by Pete Ware(Charlie Landsborough, Hazel Dean, Yazz). "Lovin What I Do" is quite simply an aural delight!